Thanks for providing the link to Mad in America - I'll have to follow up and read more. The withdrawal struggle is certainly important to pay attention to for our clients. 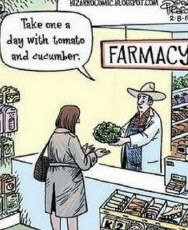 I'm enjoying the comic here of the "Farmacy." If only fresh vegetables could solve our mental health issues. Then we wouldn't have to worry about withdrawal symptoms from antidepressants. Have you developed any light treatment protocol for people who did not know anything about tapering and have had very severe (cognitive impairment, persistant akathisia, headache, tremor, etc.) and protracted (2 years and counting) reactions to SSRIs or other medications?